To develop the concept for their newest golf ball, Taylormade Golf spent a lot of time on tour asking questions. What do players like about the ball the play? What do they dislike? 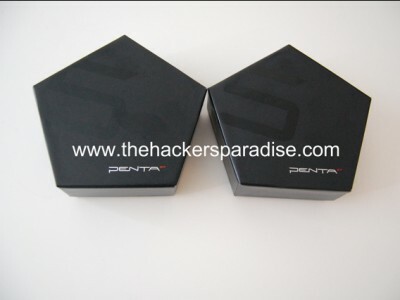 The answers to all of the questions inspired them to create their newest ball, Penta TP. This golf ball took three years to develop as their R&D team carefully experimented with different mantle materials, compositions and thicknesses until the ideal combination was defined. Extensive computer modeling, prototype creation, robot testing and player testing went into creating what they believe is the finest all-around performing golf ball of its kind, a ball that delivers outstanding performance on every key type of shot a golfer has to hit while also delivering tremendously soft and responsive feel off everything from driver to putter. 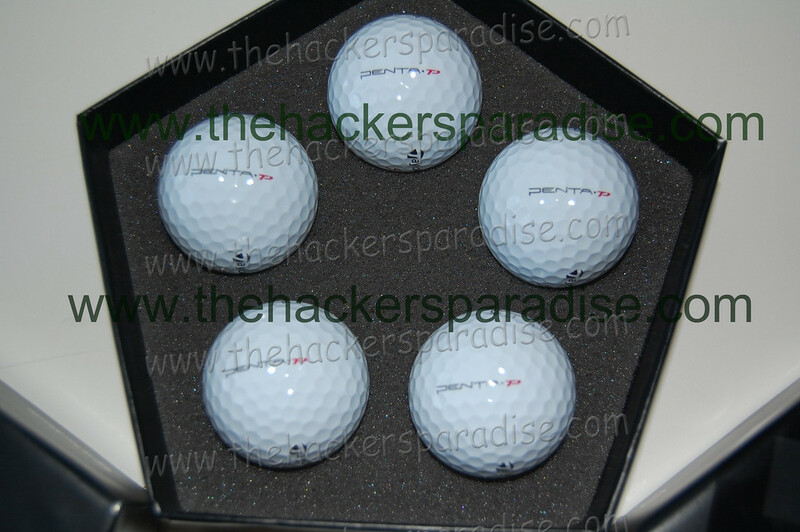 When myself and the rest of the equipment testers here at The Hackers Paradise learned that Taylormade Golf was putting together a 5 piece golf ball we were a little unsure of how it would work with amateur golfers. The two biggest questions coming up from us and our readers were the same. “Could an average player compress the the ball enough to have the golf ball work for them and with five layers in each ball, what kind of durability would these have?”. Hopefully by the time this review is complete we will have answers to those questions. THP was the first website to have a hands on look at the new Taylormade Penta golf balls with our unboxing last week for our forum members, and we even had a giveaway to our forum members to try these balls out to get feedback from all different types of players. By doing so, we hope it can add a value to our readers to be able to identify with a certain player and see different opinions on this golf ball. Only at The Hackers Paradise will you find not only a review, but opinions from readers not associated with us or the equipment companies reviewing equipment given to them by a site before the product even hits the street. Obviously the biggest news about the Taylormade Penta TP golf ball is that it is the first tour ball constructed of five solid layers. 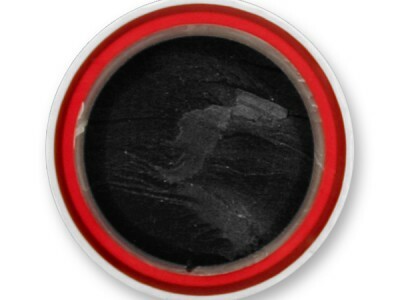 The five layers of Penta TP include the core, inner mantle, middle mantle, outer mantle and cover. The soft Urethane Cover promotes a higher than average spin-rate on the all-important partial wedge shots required in the scoring zone, within 100 yards of the flag. These are the types of shots where many current tour balls fail to deliver the goods because they launch too high and don’t spin enough. Instead, most tour pros want a ball that launches lower and spins enough to stop fast after one or two bounces, which gives them maximum control over these types of shots. 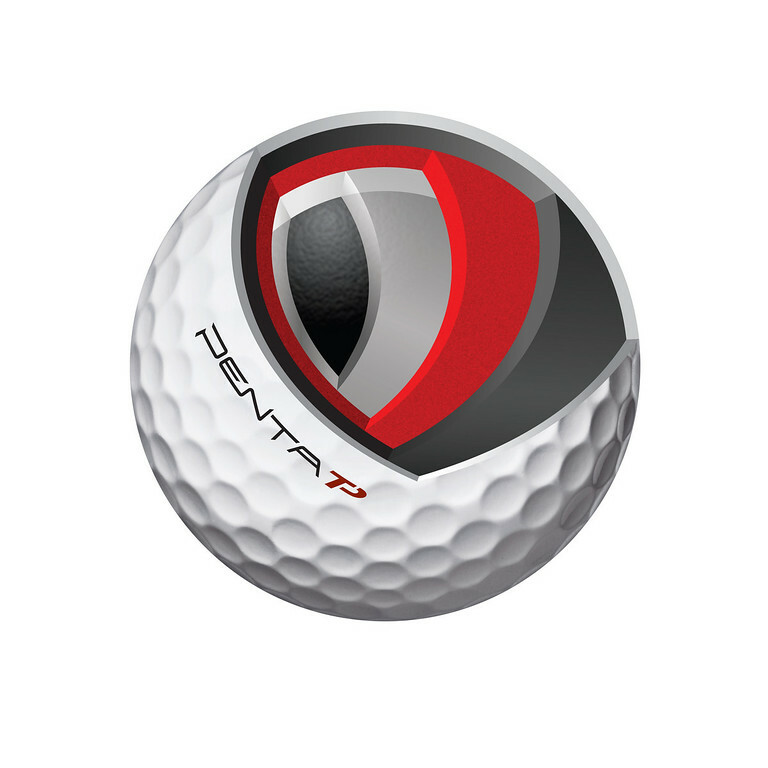 Penta TP’s soft, durable Urethane Cover has the necessary characteristics to deliver that coveted combination of lower launch angle and higher spin-rate, while also providing soft tour feel. The firm and fast Outer Mantle promotes optimum spin off the short-irons to stop the ball quick without sucking it off the front of the green or drawing it back too far from the hole. The Outer Mantle is the fastest mantle in the ball; because it’s positioned just beneath the cover it’s easily compressed by slower swingers (ball speeds 120 mph and below), helping them to generate higher ball speed for increased distance. The semi-firm and fast Middle Mantle, which surrounds the Inner Mantle promotes mid-launch and mid-spin off the middle irons. Mid-launch promotes control; mid-spin keeps the ball from up-shooting, ballooning and falling short of the target. The Middle mantle consists of a fast material, allowing medium-slow swingers (who average from 120 to 140 mph in ball speed) to generate more ball speed and distance, as they will compress only the two outermost mantles underneath the cover. The soft, fast Inner Mantle, which surrounds the core, promotes soft feel, high launch and low spin off the long-irons for exceptional distance and high, soft-landing flight that helps the ball sit quickly on the green. Because the Inner Mantle consists of a fast material, it helps players who average from 140 to 160 mph in ball speed to generate more ball speed and distance, because although they don’t swing fast enough to activate the core, they are able to activate the three layers between the core and cover including the inner mantle, which is the deepest of the three. The extremely soft, low-compression core is the most critical layer to promoting high launch and low spin off the driver, which are well known to be the launch conditions that promote maximum carry and distance. Despite being soft and low-compression, Penta TP’s Core is still very fast, which allows players who generate fast ball speed — in the 140 to 180 mph range — to generate more ball speed. Which means that long-hitters who play a tour ball will likely be longer with Penta TP. We received a few boxes of the Taylormade Penta and my first reaction was that the box itself is very cool. I would love to see the company use a box like this to draw attention to the product, but the packaging and holding the golf balls in place could be an issue if they used these. Each box came with a few golf balls in it, so we contacted a few of our testers and immediately went over to the practice green for some early short game testing. Four of us were each armed with 3 Penta TP balls each. We started with pitch shots, then moved on to chipping, and finally putting. Tim O – 12 Handicap – “Around the green I am not as sure as the others as to what I am looking for. They spun like crazy on chips and it took me a few swings to get used to it compared to the Pro V1x that I have been playing. I would have liked the little arrows on them for putting, but that is easy to fix. The only way to describe the feel is really soft off my wedge. With the initial short game practicing out of the way, the four of us headed to the course for the first of 6 rounds of golf together over 3 days. Here are our initial reactions grouped together. Distance & Tee Shots – The two low handicap players in our group found 8-10 yards of distance increase between the Taylormade Penta TP and their current ball the Titleist Pro V1x. Both thought the ball had a great trajectory and loved it off the tee. Myself and the mid-handicap player found no distance increase in the ball, however we did not notice a decrease at all. One thing all four of us were nervous about going in was the ball flight off the tee and if we would see an increase in hooks or slices. We can happily report back that those that play a cut or fade had it stay that way and those that played a draw never had it turn into a hook. It seemed as though there was no increase in side spin for any of us. Approach Shots – All four of the golfers felt as though the ball really shined here. The low handicap players once again found themselves saying distance was great. Even saying that on long approaches, they could change clubs. But the real key for most of us here was that because of the increase in sticking ability we were getting, we were able to hit a much larger variety of shots into each green without the fear of the ball not stopping. Greenside – We spoke in depth about this above and I will add that on the course, we all had our initial thoughts confirmed. The ball stops on a dime and is about as spinny as anything we have tried over the last few years. Our lowest handicap player put it this way. “It is like you taking what I love about the ProV1x and adding in some Taylormade TP Black and some Srixon Z-Star”. Putting – Three of us loved it on the putting green and one of us did not. On the green it gives you a super smooth roll with a great soft feel. Nobody had any issues with it really and we all liked the simplified graphics that are on the ball. However one of the testers really missed his arrows for an alignment aid. For those that do not like that clicky sound that you get with some balls out there right now, you have no worries, as the sound of these is extremely pure. Durability – I played the same ball for 18 holes. (lucky I know) None of us had any real issues with durability, however all four of us noted that they were not as durable as a few of the other premium balls out there. They will get scraped with large grooves in wedges, but no major cuts or anything such as that. 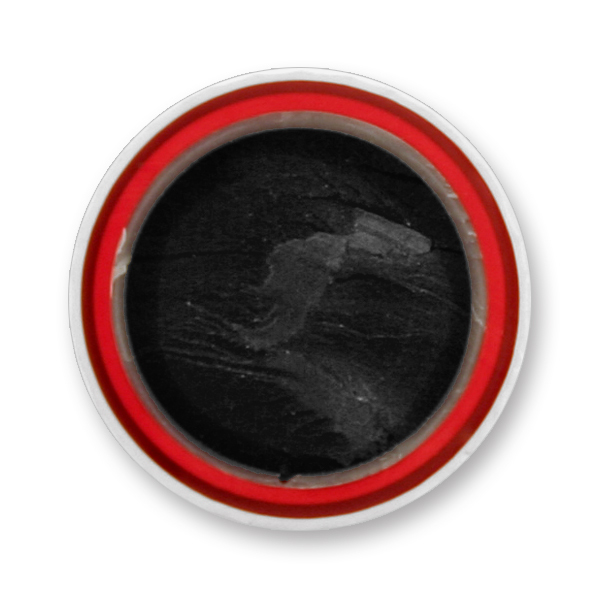 As many of our readers know, I was not a huge fan of the Taylormade TP Red or the TP Black. I loved certain things about each one and had trouble with some of the aspects that each ball had. 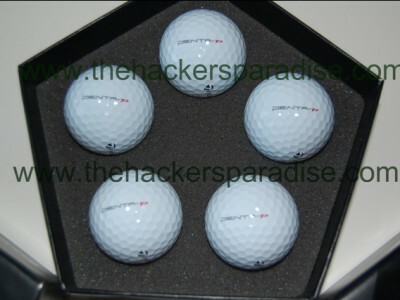 Working with the Penta TP has changed my view of the Taylormade golf balls. It seems to this reviewer like they took the good from each one in the series and put them together to eliminate the guess work on which one to play. All four of our testers came away extremely impressed with the playability of the ball and every one of the players that got to test the ball thus far, look forward to the release. Tour validation has already been apparent as some players put these in their bag for the week of a major and that has to say something about their belief in the product. 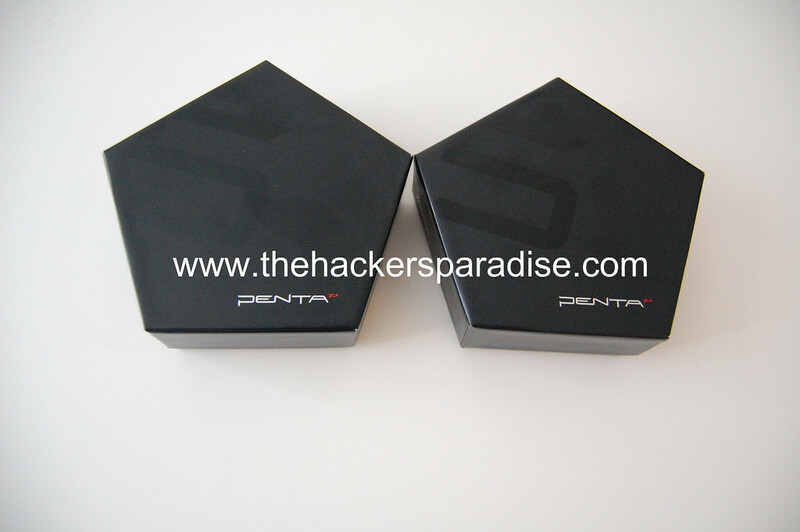 In the end, the Penta TP was able to answer our questions and all of our testers gave it high marks. Upon release I think it is something for each and every person that is looking for the highest level of golf ball to try out. Stay tuned to our forum for the next seven days as our three lucky testers post their feedback and answer questions on their testing of the Penta TP as well. Only at the site For consumers, By consumers can you find info on the products before release and even get them in your hands to try out once in a while. Look for the Taylormade Penta TP golf ball in warmer climates around or a little before 12/1/09 and hitting the rest of the country in the Spring. We urge everybody that is looking for a tour level golf ball to give these a shot. For more information on all the products that Taylormade Golf has out, check out their website at www.taylormadegolf.com. UPDATE: We have been using the Penta Balls for quite some time now and our feelings of them are even stronger. The ball has everything someone wants out of a premium ball and we have yet to find any compromises or issues with it at this time. We will continue to update this review as we have more testers try the ball out from our Taylormade Penta Giveaway, so stay tuned. Based on your review of this ball I have pre-ordered them for a big golfing trip of 100 guys to Myrtle Beach in early December. I am having them delivered next-day air so hopefully I receive them before I leave on the 5th for 5 rounds at 5 different courses (All these 5’s must mean something). There are significant rewards for playing well at this excursion so I’m hoping that your review is accurate. It will be the first time I play with them, providing they arrive in time. 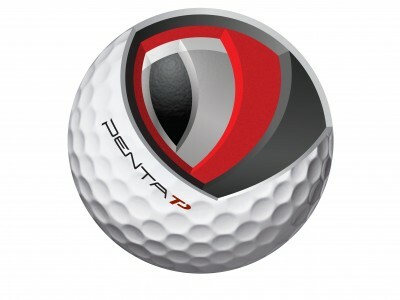 Can anyone direct me to a web site where I can pre-order the new Penta TP Golf Balls. I only use Pro V1x at the moment but after watching Sergio Garcia recently using this ball I want to try some. You can also get them off of ebay, but price is running pretty high ~$70 + shipping. If you live in Southern CA, each of the big chain golf stores (Roger Dunn, Nevada Bob’s, etc.) received a few dozens in their stores. I picked up a sleeve to try out this coming weekend. They sell $45.99/dz or $11.99/sleeve. 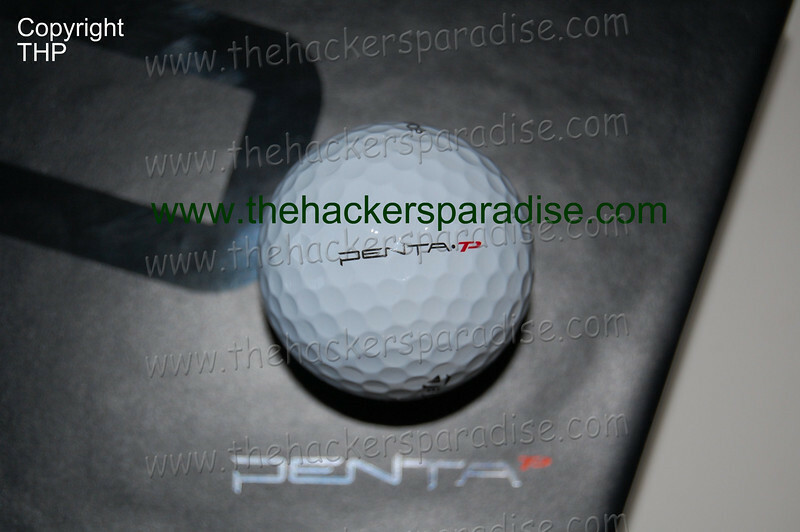 Found one, did not recognize it as a new Penta at the time; hit it once off the tee and said “wow” what was that .. hit it again and and said “gotta have some of these” .. that was before i knew the price but this ball may just be worth it! As exciting as the Pro-V was first time i hit it! 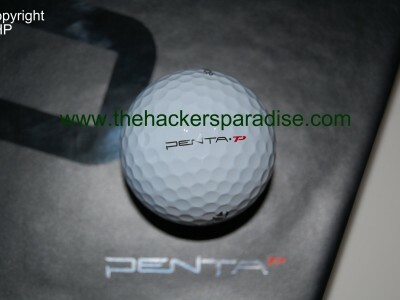 I picked up some “pre-owned” Penta’s through Lost Golf balls site just to try it out. I’ve only been playing this game two years now so I’m definitely not an aficionado on equipment. My driver SS averages about 105 or so and I’ve been making better contact these days. I went out to this local course, usually my nemesis, in which most fairways are lined with water on the right and the left! I can’t tell you how many golf balls I’ve lost here. Combined with my anniversary gift, the TM Supertri, the Penta was a dream to hit. I’ve tried most golf balls out there and this just felt terrific on every hit, especially wedge shots. The only other ball that I’ve ever played that would just stop on a dime like this would be the bridgestone b330s. I only missed 5 GIR, and only a few fairways. It had great feel off the putter as well. My buddies kept talking about my accurate speed and pace on the greens (the penta was my little secret). I’m not a big guy by any means…5’8″, 170 lbs but I got some fantastic distance on all my shots. As a matter of fact, I ended up having to club down many times or choke up because at least 3 times I overshot the green (overshot the flag by 20 yards with a 8 iron for a 145 yd shot). I also had my longest drive yet-307 yds! For the first time I almost broke 90 (ended up with a 91) which is 11 strokes better than the last time played here. If it wasn’t for two balls in the water I would have broken 90 for the first time! I say all this because even though my swing has gotten better I attribute much of it to the ball I was playing. It gave me a lot of confidence with every shot.